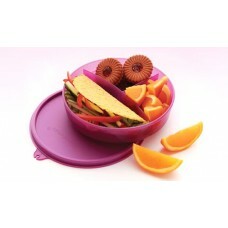 Ideal for your little one and even adults, a smart product designed especially to meet lunch box needs. Ideal for storing and serving baby food and kids snacks/tiffin prepared in advance. Ideal for giving packed favourite lunch or snack for your kid to take to school or outing. A convenient size, it can be accommodated in any hand bag or school bag. Includes one divided dish and one seal. Divided dish-Three compartment design keeps food neatly separated. The 3 separate compartments in the dish makes it possible to serve three of your favourite snacks or dishes for lunch or snacking. Virtually liquid-tight seal offers superior storage and makes it easy to transport foods. The seal is air tight, keeping food fresh and hygienic for a long time. Recommended for children 6 months and above.